The bar-mekko chart below shows the number of public holidays (height) and population (width) of select countries around the globe. The area of each segment is proportional to the total number of ‘human-holidays’ each country provides. Colombia and India have the highest number of public holidays per person but India leads the number of human-holidays due to its large population. This chart was built using the Aploris add-in with PowerPoint 2016 for Mac. This entry was posted in Bar-mekko and tagged Global, Politics by Aploris. The bar-mekko chart below is a variant of the Marimekko chart. It shows global greenhouse gas emissions by continents. Each region’s population is displayed by the width of each column. The population of a continent is therefore proportional to its range on the x axis. The column labels also include the population data. The height of each column in a column shows the amount of emitted greenhouse gases per capita. With this data representation the area of each segment is proportional to the total amount of a continent’s greenhouse gas emissions. Colored segments are used to differentiate between different types of greenhouse gases. Because some the of segments were small, a legend is used. For cleanliness, the labels for smaller segments were excluded. This Mekko chart was built with PowerPoint 2016 on OS X using the latest Aploris for Mac release. This entry was posted in Bar-mekko and tagged Climate by Aploris. The mekko chart, or specifically the bar-mekko chart, below shows greenhouse gas emissions for the 5 largest US states. The width of each column is proportional the state’s population. The column labels also include the population data. The height of each segment in a column represents metric tons per capita emitted for each type of greenhouse gas. Because some the of segments were small, a legend is used. For cleanliness, the labels for smaller segments were excluded. In addition, this mekko chart has visible x and y axes. This mekko chart was built using Aploris on a Mac with PowerPoint 2016. 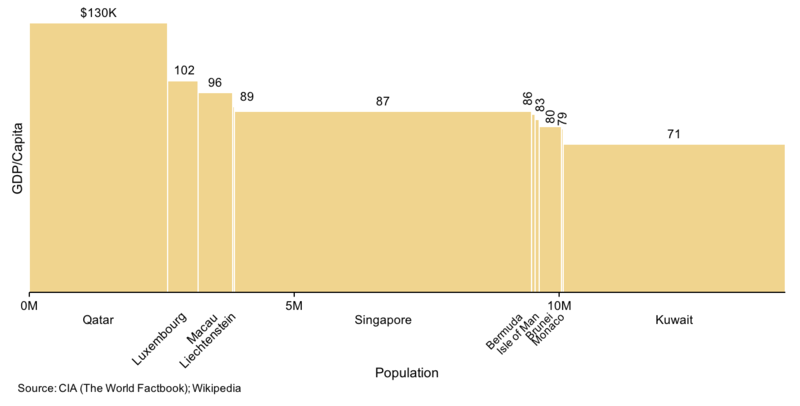 The bar-mekko chart below efficiently shows Internet penetration in different geographies around the world. The height of each segment is the penetration percentage; the width is the size of the population. Therefore, the area of each segment allows the reader to quickly compare the number of active internet users in different geographies. The bar-mekko is similar to the Marimekko or mekko chart except it has a variable height. It is also effective when used to compare profitability of value chains and business segments. This entry was posted in Bar-mekko and tagged Global, Internet by Aploris. The bar-mekko chart below shows the estimated labor surplus or shortage by country in 2030. The x-axis, or the width of the bars, depicts the size of the labor force and the y-axis, or the height of the bars, shows the percent labor surplus/shortage. Therefore, the area of the bar indicates the absolute surplus or shortage. However, for Germany and Brazil we use the axis break to make the chart more readable. As such, the area of the respective bars is not the true representation of the absolute surplus/shortage. This data was published by BCG and Business Insider based on work led by BCG partner Rainer Strack. This entry was posted in Bar-mekko and tagged Business by Aploris. This chart shows the amount of car travel in three metropolitan areas of California. 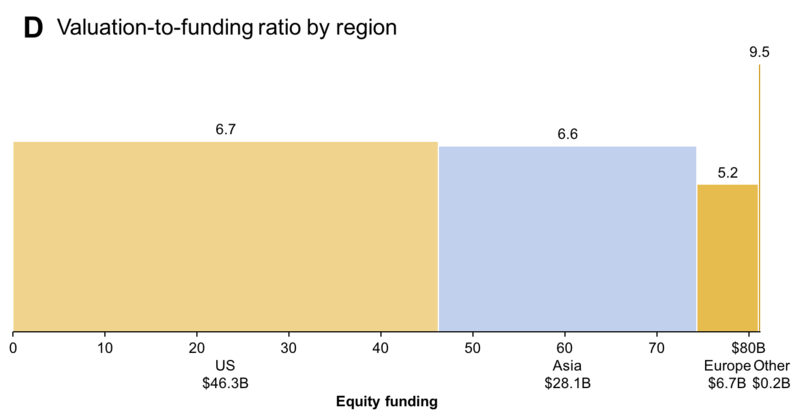 A variable-width column chart is used to depict the interplay of two factors. Along the x-axis the existing roads are plotted in terms of lane miles. This means that for instance a 100 miles of three-line a highway add 300 lane miles. The y-axis shows how often each lane mile is traveled per day. The product of lane miles and travel per line equals the amount if daily travel miles. If each lane of said highway section is passed by 15,000 cars per day, 4.5 million travel miles are added to the total. With variable-width chart this relationship is made clear as the width and height form the area of each element. A line of additional data below the plotting area shows the average delay per lane mile in each area. Unsurprisingly, in densely populated areas more intensely used roads lead to higher delays. With Aploris Charts this value is part of the chart data and can be the result from a calculation based on other chart data. This means that values and positions are automatically updated if any of the input values changes. This type of chart is also known as a bar-mekko or skyline chart. It can be viewed as a variant of a Marimekko chart or a cross between Marimekko and column chart. In a simple application like here only one series of data is displayed while more complex application may also stack multiple series. This entry was posted in Bar-mekko and tagged Travel by Aploris.